Trey Landers drives on Marcus Santos-Silva in the 2nd round of the A-10 Tournament. 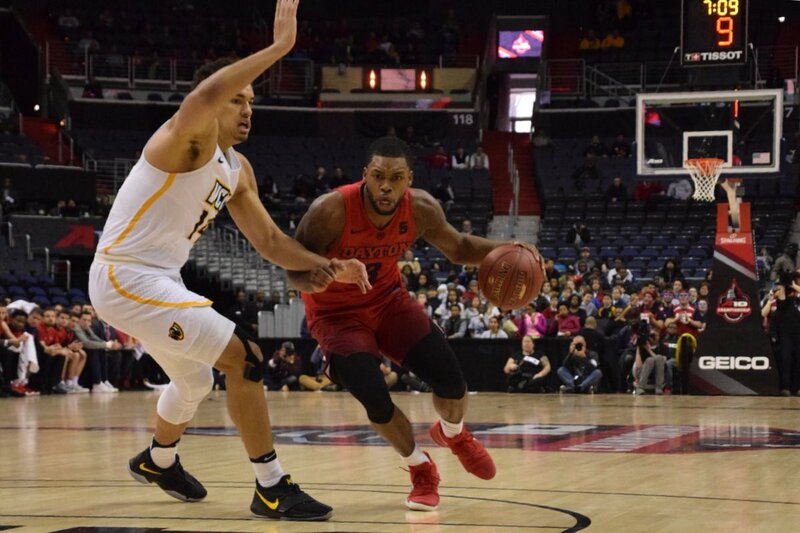 WASHINGTON, D.C. — The second round of the Atlantic 10 men’s basketball tournament was filled with near-upsets and blowouts alike. Near-upsets refers to the fact that although Dayton, Massachusetts, and George Washington all held leads at some point in their games, all four lower seeds in the second round lost on Thursday. The day began with a high Noon matchup between No. 8 VCU and No. 9 Dayton. The second game of the day featured No. 5 George Mason against No. 13 Massachusetts, who had beaten La Salle the previous day. The Minutemen held a 14-point lead midway through the first half, but the Patriots roared back to tie it at 39 before defeating Mason 80-75. In the third matchup of the day, Duquesne fell decisively to Richmond, 81-68. The Dukes looked out of sync and unprepared for the Spider’s offense.